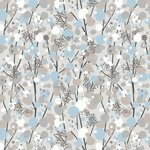 Beige with tan blue white and grey-pink circles with Brown lines/stems in the background. From the Dry's collection from Blank Quilting. 100% cotton. 44"-45" wide.